achieve much through your kindness. To the entire staff of Blouvlei School we want to express sincere and heartfelt thanks for their commitment and dedication. To our S.G.B and parent community we say thank you for your support. We want to thank Mrs. Jacobs for her leadership in the absence of Mr. Cowley. You have continued to give guidance and managed the school very aptly. This year has been both exciting and challenging. May God Bless you over this period of festivities. Blouvlei School has formed a partnership with ARTLINK. 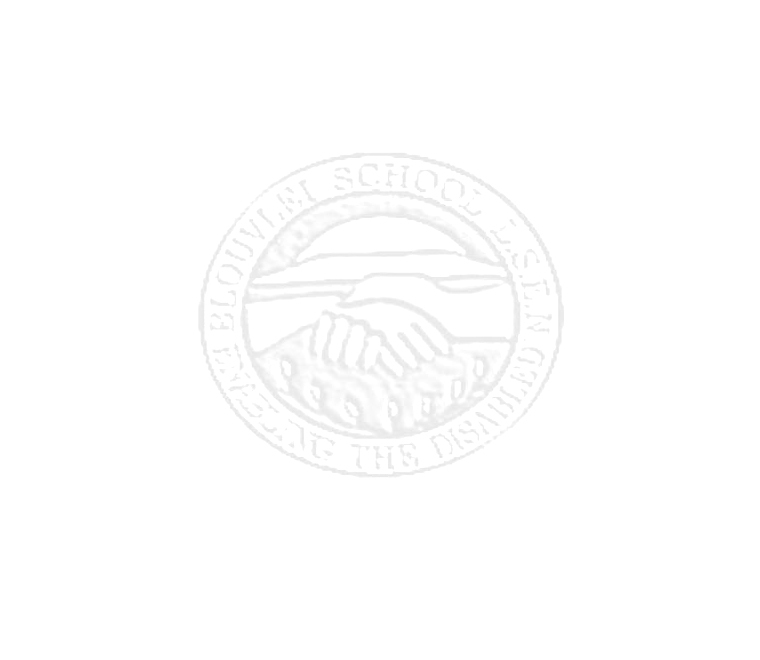 This means that our school will now be affiliated to Creative Connections in Ridgefield in the U.S.A. Our school will therefore be linked to a school overseas whereby works of art are exchanged. A selection of the art work will be done and then be displayed at the International Children’s Art Exhibition in 2007. The art work of 14 learners was submitted. The motto of Artlink is: “Creating a society where people with disabilities can learn through, participate in, and enjoy the arts”. 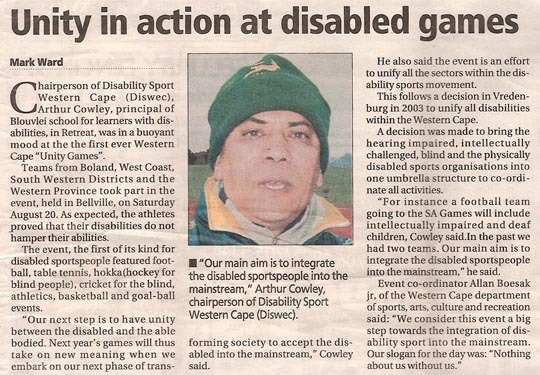 Blouvlei participated in the Special Olympics Provincial Games that was held in Bellville from the 20th to the 21st of September. Our soccer team won the finals of the men’s team sport. The following three learners will be representing the school at the National Games in Johannesburg from the 1st to the 3rd of December: Herman Lombard, Reginald Isaacs, and David Marks. A draw will take place for the team sports in Johannesburg that could see our soccer team going to China in 2007. A special programme was organised by Sr.Erntzen on the awareness of HIV/AIDS and the effects it has on communities. Care and understanding is crucial for those affected in order for them to enjoy a normal and fulfilling life. The following learners are part of a team of 11 learners who will be attending the SASSA II Developmental Games in Tswane during the September holidays. We are extremely proud of their achievements. 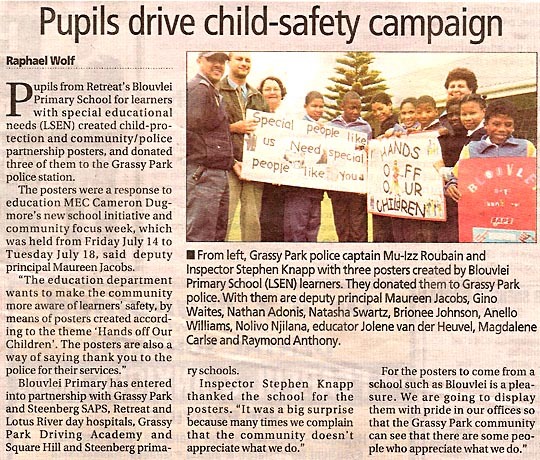 We want to thank the Steenberg Safe Schools Cluster as well as Grassy Park High for their support with the weekly purchasing of meals and donations towards this event. Because of your generosity we were able to raise the amount of R18-000 needed to fund this project. We also need to thank the parents of the learners as well as Blouvlei staff for their commitment in the preparation of the meals that was sold to the supporting schools. 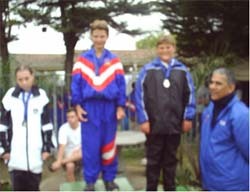 The following learners participated in the Special Olympics Western Cape Provincial Games on the 20th and 21st of September. Blouvlei School wishes all Muslims well over the Holy Month of Ramadaan, a month wherein every Muslim shares the pangs of hunger with the less fortunate and is reminded of the favours that we have been blessed with. We need to THANK all those who contributed and supported the big screen event held on the 9th of July 2006. We were somewhat disappointed in the attendance of the event by our parent community. Due to the low turn out we still have a number of tickets outstanding. We would like to urge our parents who have not made a contribution to please settle the outstanding amounts with Mrs. Jacobs. Schools were once again encouraged to implement programmes and organise events to raise awareness of HIV and AIDS during the month of September. The importance of promoting healthy lifestyles with regard to sexuality and creating caring schools and communities for those infected and affected by HIV/AIDS has been stressed by both the Provincial Minister of Education, Cameron Dugmore, and Premier Rasool. 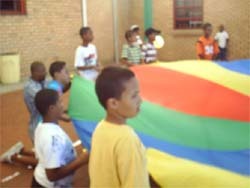 Blouvlei School participated in the Community-School Focus Initiative Week of August 14 to18 2006. This is a long-term initiative to encourage schools to examine their relationship with their community or with all the communities that could have an impact on them. 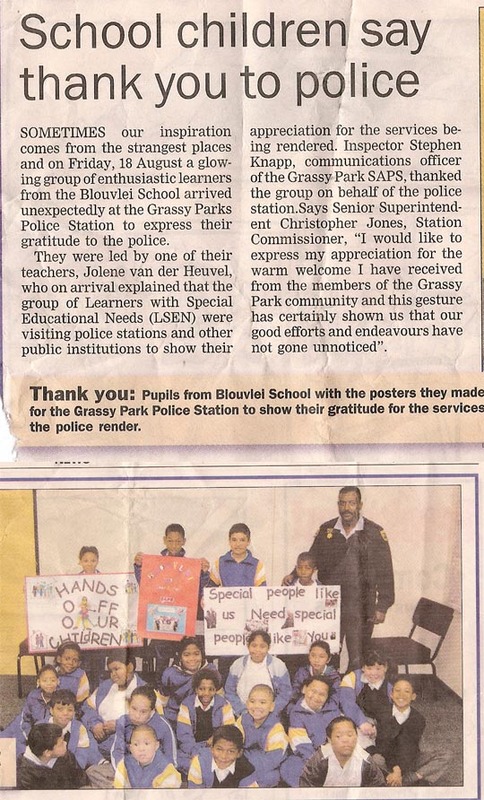 Partnerships were formed with the Steenberg/Grassy Park Police Station, Square Hill / Steenberg Primary, Retreat / Lotus River Day Hospital. Mr. Cowley has been seconded to EMDC-South for a period of four months as ELSEN ADVISOR. Mrs. Jacobs has assumed the role as Acting Principal at our school in the absence of Mr. Cowley. We welcome Mr. Classen as a driver at our school. Welcome to Ms. Van Heerden our new Occupational Therapist. We sadly had to bid farewell to Mr. Brown who retired after twelve years of service as our General Assistant. On Monday 11 September we had a visit by a group of members from the Bible Institute, who had interaction with our learners through a puppet show, storytelling, and one to one discussions. We want to thank Rev. Greg Phillips and his dedicated team for the work they are performing in the community. Rayepen family for assisting so well and for sacrificing their time for the S.W.C. event. A youngster came home after her first day at kindergarten and complained, ‘What’s the use of my going to school? I can’t read, I can’t write, and teacher won’t even let me talk! On the 18th and 23rd of May 100 learners from Blouvlei, visited the Aquarium and where thoroughly impressed by the exhibits and the beauty of the Atlantic Coastline. The learners were treated to a puppet show introducing what eats what in the sea. 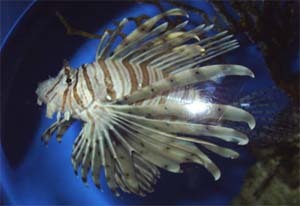 The Two Oceans Aquarium Environmental Education Centre has stimulating programmes that complement work done in schools. The activities involve the learners to discover and learn about freshwater, coastal and marine environments. We enjoyed this wonderful opportunity, whereby the learners and adults could greatly benefit by the knowledge obtained from the visit to the interesting world of Marine Life at the Two Oceans Aquarium. 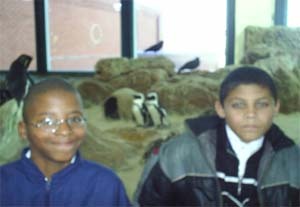 This was the first visit to the Aquarium for many of our learners. We value the partnership we share with the Aquarium. Many thanks from all the learners and staff that could benefit from the programme. On the 27th of April 20 learners participated in the Elite Disability Walkathon. It was a 5 km walk which formed part of Freedom Day Celebrations. The event had been sponsored by the Elite Group of Companies and was supported by a number of sponsors. This was a great opportunity for the learners to make new friends and to be able to have interaction with other organizations. Each learner who participated in the walk received a t-shirt, medal and a certificate. In addition to this they received a number of delicacies from all the sponsors. The school also received a donation for their participation. An HIV/Sexuality training session was held at Blouvlei for the period 19-04-06 to 25-04-06. Six educators as well as Sr. Erntszen attended the training. 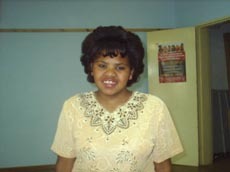 Our learners participated in a ballroom Dance competition on the 10th of June. A number of medals and certificates were awarded for their participation and achievements. A home is a special place, a place to grow up, feel safe and secure in. Not all children have it like that, but most of them have dreams of how they would like to live. Sad to say that there are some of our learners who are not exempt from this. As parents and caregivers we provide the best we can for our children, yet many are neglected and abused. If you are feeling threatened, tell someone that you trust. If you are not believed – tell someone else. Know your own limits over others and know the limits that others have towards you. Be proud of your youth and enjoy it. Girls and boys, protect and stick up for each other, for what is right. THANK YOU TO ALL THOSE WHO HAS GENEROUSLY DONATED TO OUR SCHOOL DURING THIS QUARTER. We welcome Mrs. Monis to our staff. We had to bid farewell to Mr. Manuel, one of our drivers and we wish him well. Miss McGregor our Occupational Therapist will be leaving at the end of this term to take up a permanent position. We wish her well in her future endeavours. We want to thank the Cape Times Fresh Air Camp for once again sponsoring the entire week of the 6th to the 10th of February 2006. This is undoubtedly one of the highlights the learners experience during the year. We would also like to express our thanks to all our volunteers as well as the staff for making the camp a memorable experience. 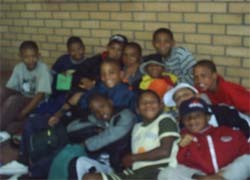 Twenty of our learners including coaches participated in the City of Cape Town family Walk 2006. 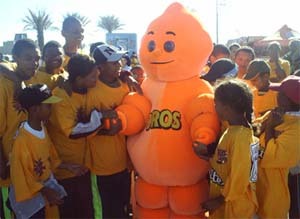 This formed part of Human Right’s Day celebrations on the 21 of March 2006.The 7 km walk was thoroughly enjoyed by all who participated in the event. Medals were awarded to the first 6000 entrants who finished. A variety of lucky draw prizes was up for grabs. The event included loads of entertainment, refreshments, shows, exhibitions, a craft market, kiddie’s rides and lots more! The school has been taking part in the following sporting codes for the first quarter of 2006. Three of our learners represented our school at the Retreat Club Gala. 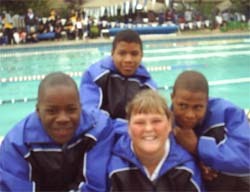 Reginald, Bianca and Flavio competed against able bodied learners of other clubs. They enjoyed themselves and did their best. They understood that it was not about coming first, but for their enjoyment, exposure as well as in preparation for the SASSA II Summer Games to be held in George. 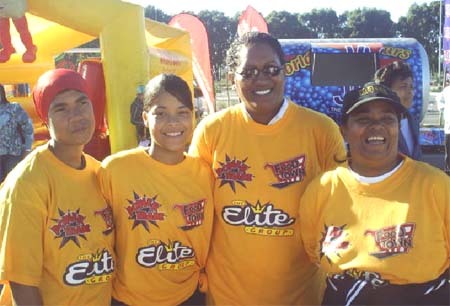 Flavio, Bianca, Reginald and Moenier participated in the SASSA II Summer Games in George from the 20th to the 24th of March 2006. Here Mr. Cowley presents Bianca with a medal. Between the four of them they scooped 14 medals and one trophy. We want to thank our parents for attending the PTA’s. We are always encouraged by our parent community for their interest shown in our learners. Thank you Mr. Wilson Retreat Pool Supervisor, for allowing our learners to make use of their facilities and for his staff for the manner in which they receive our learners. We also want to thank Retreat Club for the use of their equipment. Thank you also to the coaches of the Grassy Park Swimming Academy for their expertise and for the training of our learners. Thanks Mrs. Oliver and Mrs. Harrison for assisting with the daily preparation of the bread. Your contribution is greatly appreciated. Thanks to Alan Wise Optometrists, Edgars Stores and Clicks, Blue Route Centre as well as Friends of Rentworks for their contribution towards our Talent / Variety Contest. Learners are encouraged to wear school uniforms. Parents are requested to see to it that learners are dressed appropriately for school. Please be reminded of the excellent prices that we received for the bathing costumes. We need our parents to support our fundraising events every Friday. The much needed funds will be utilised towards our school leavers graduation function as well as to our different sporting codes. This was great fun and our learners had the opportunity of showcasing their talents. Some of our learners went the extra mile in preparation for the show. 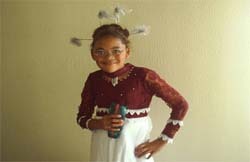 Here we have an insert of Melissa Beukes who took pride in her costume for the variety show. Advertising costs are becoming very expensive. We would like to afford our parents and the business community the unique opportunity of advertising on our web site. For a nominal fee of R100 per month we will place a banner size advert on our web site. The number of visits to our web site for the period August 2005 to March 2006 was more than 30 000 in total. Expand your business today and save on exorbitant advertising costs. The web site statistics are available at the school on request. 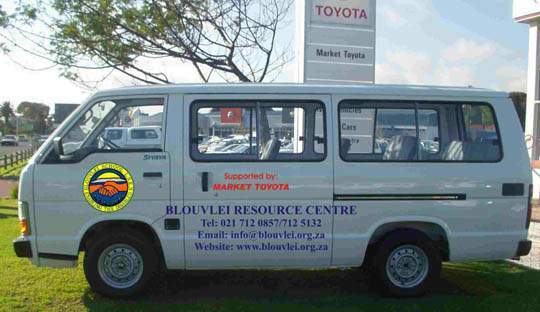 Blouvlei is proud to announce that due to the generosity of The Western Cape Education Department, Dr. Theron as Director of SLES Directorate, and in conjunction with Market Toyota, Tokai through Mr. Ryk V. Reenen and Mr. Ziller of the Tokai branch we have acquired a new 16 seater school vehicle. This enabled us to replace a vehicle which was 18 years old, and which was costing us a fortune to maintain. If you need mystemtutor , then the team of professionals from mystemtutor is here to help you.